When using Docker, we start with a base image. We boot it up, create changes and those changes are saved in layers forming another image. So eventually I have an image for my PostgreSQL instance and an image for my web application, changes to which keep on being persisted. So the question is: What is a container? An instance of an image is called a container. You have an image, which is a set of layers as you describe. If you start this image, you have a running container of this image. You can have many running containers of the same image. You can see all your images with docker images whereas you can see your running containers with docker ps (and you can see all containers with docker ps -a). So a running instance of an image is a container. In Dockerland, there are images and there are containers. The two are closely related, but distinct. For me, grasping this dichotomy has clarified Docker immensely. An image is an inert, immutable, file that's essentially a snapshot of a container. Images are created with the build command, and they'll produce a container when started with run. Images are stored in a Docker registry such as registry.hub.docker.com. Because they can become quite large, images are designed to be composed of layers of other images, allowing a miminal amount of data to be sent when transferring images over the network. IMAGE ID is the first 12 characters of the true identifier for an image. You can create many tags of a given image, but their IDs will all be the same (as above). VIRTUAL SIZE is virtual because it's adding up the sizes of all the distinct underlying layers. This means that the sum of all the values in that column is probably much larger than the disk space used by all of those images. The value in the REPOSITORY column comes from the -t flag of the docker build command, or from docker tag-ing an existing image. You're free to tag images using a nomenclature that makes sense to you, but know that docker will use the tag as the registry location in a docker push or docker pull. The full form of a tag is [REGISTRYHOST/][USERNAME/]NAME[:TAG]. For ubuntu above, REGISTRYHOST is inferred to be registry.hub.docker.com. So if you plan on storing your image called my-application in a registry at docker.example.com, you should tag that image docker.example.com/my-application. The TAG column is just the [:TAG] part of the full tag. This is unfortunate terminology. The latest tag is not magical, it's simply the default tag when you don't specify a tag. You can have untagged images only identifiable by their IMAGE IDs. These will get the <none> TAG and REPOSITORY. It's easy to forget about them. More info on images is available from the Docker docs and glossary. To use a programming metaphor, if an image is a class, then a container is an instance of a class—a runtime object. Containers are hopefully why you're using Docker; they're lightweight and portable encapsulations of an environment in which to run applications. Like IMAGE ID, CONTAINER ID is the true identifier for the container. It has the same form, but it identifies a different kind of object. docker ps only outputs running containers. You can view all containers (running or stopped) with docker ps -a. NAMES can be used to identify a started container via the --name flag. How to avoid image and container buildup? One of my early frustrations with Docker was the seemingly constant buildup of untagged images and stopped containers. On a handful of occassions this buildup resulted in maxed out hard drives slowing down my laptop or halting my automated build pipeline. Talk about "containers everywhere"! Always remove a useless, stopped container with docker rm [CONTAINER_ID]. Always remove the image behind a useless, stopped container with docker rmi [IMAGE_ID]. While it's simplest to think of a container as a running image, this isn't quite accurate. An image is really a template that can be turned into a container. To turn an image into a container, the Docker engine takes the image, adds a read-write filesystem on top and initialises various settings including network ports, container name, ID and resource limits. A running container has a currently executing process, but a container can also be stopped (or exited in Docker's terminology). An exited container is not the same as an image, as it can be restarted and will retain its settings and any filesystem changes. The file system and configuration(read-only) application which is used to create containers. More detail. These are running instances of Docker images. Containers run the actual applications. A container includes an application and all of its dependencies. It shares the kernel with other containers and runs as an isolated process in user space on the host OS. More detail. The background service running on the host that manages the building, running and distributing Docker containers. The command line tool that allows the user to interact with the Docker daemon. Store is, among other things, a registry of Docker images. You can think of the registry as a directory of all available Docker images. A picture from this blog is worth a thousand words. Pull image from Docker hub or build from a Dockerfile => Gives a Docker image (not editable). Maybe explaining the whole workflow can help. Everything starts with the Dockerfile. The Dockerfile is the source code of the Image. 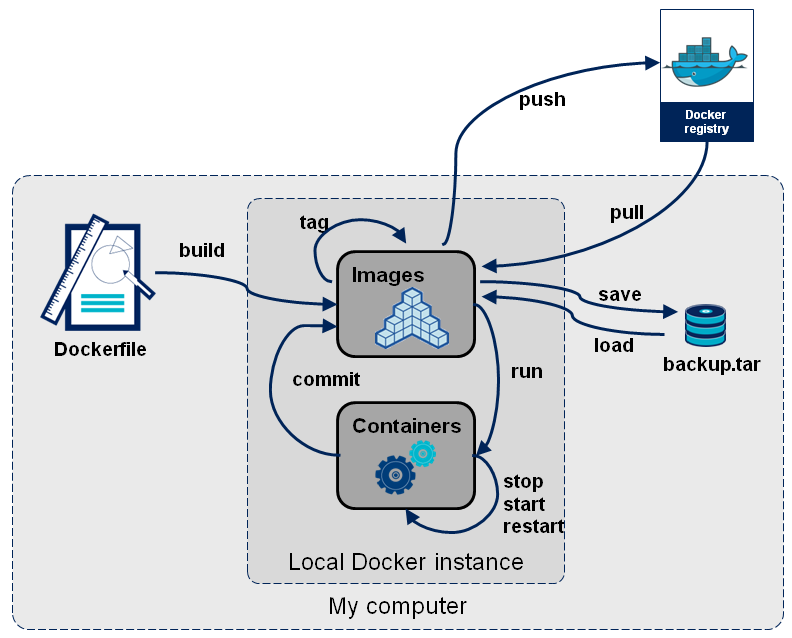 Once the Dockerfile is created, you build it to create the image of the container. The image is just the "compiled version" of the "source code" which is the Dockerfile. Once you have the image of the container, you should redistribute it using the registry. The registry is like a git repository -- you can push and pull images. Next, you can use the image to run containers. A running container is very similar, in many aspects, to a virtual machine (but without the hypervisor). Here is the end-to-end workflow showing the various commands and their associated inputs and outputs. That should clarify the relationship between an image and a container. I couldn't understand the concept of image and layer in spite of reading all the questions here and then eventually stumbled upon this excellent documentation from Docker (duh!). The example there is really the key to understand the whole concept. It is a lengthy post, so I am summarising the key points that need to be really grasped to get clarity. Layer: Each layer represents an instruction in the image’s Dockerfile. Example: The below Dockerfile contains four commands, each of which creates a layer. Importantly, each layer is only a set of differences from the layer before it. Container. When you create a new container, you add a new writable layer on top of the underlying layers. This layer is often called the “container layer”. All changes made to the running container, such as writing new files, modifying existing files, and deleting files, are written to this thin writable container layer. Hence, the major difference between a container and an image is the top writable layer. All writes to the container that add new or modify existing data are stored in this writable layer. When the container is deleted, the writable layer is also deleted. The underlying image remains unchanged. If a file or directory exists in a lower layer within the image, and another layer (including the writable layer) needs read access to it, it just uses the existing file. The first time another layer needs to modify the file (when building the image or running the container), the file is copied into that layer and modified. I hope that helps someone else like me. Dockerfile > (Build) > Image > (Run) > Container. Dockerfile: contains a set of docker instructions that provisions your operating system the way you like, and installs/configure all your software's. Image: compiled Dockerfile. Saves you time from rebuilding the Dockerfile every time you need to run a container. And it's a way to hide your provision code. Container: the virtual operating system itself, you can ssh into it and run any commands you wish, as if it's a real environment. You can run 1000+ containers from the same Image. A container is just an executable binary that is to be run by the host OS under a set of restrictions that are preset using an application (e.g., docker) that knows how to tell the OS which restrictions to apply. The typical restrictions are process-isolation related, security related (like using SELinux protection) and system-resource related (memory, disk, cpu, networking). Until recently only kernels in Unix-based systems supported the ability to run executables under strict restrictions. That's why most container talk today involves mostly Linux or other Unix distributions. Docker is one of those applications that knows how to tell the OS (Linux mostly) what restrictions to run an executable under. The executable is contained in the Docker image, which is just a tarfile. That executable is usually a stripped-down version of a Linux distribution (Ubuntu, centos, Debian etc) preconfigured to run one or more applications within. Though most people use a Linux base as the executable, it can be any other binary application as long as the host OS can run it. (see creating a simple base image using scratch). Whether the binary in the docker image is an OS or simply an application, to the OS host it is just another process, a contained process ruled by preset OS boundaries. Other applications that, like Docker, can tell the host OS which boundaries to apply to a process while it is running include LXC, libvirt, and systemd. Docker used to use these applications to indirectly interact with the Linux OS, but now Docker interacts directly with Linux using its own library called "libcontainer". So containers are just processes running in a restricted mode, similar to what chroot used to do. IMO what sets Docker apart from any other container technology is its repository (Docker Hub) and their management tools which makes working with containers extremely easy. The core concept of docker is to make it easy to create "machines" which in this case can be considered containers. The container aids in reusability, allowing you to create and drop containers with ease. Simply said, if an image is a class, then a container is an instance of a class is a runtime object. As many answers pointed this out: You build Dockerfile to get an image and you run image to get a container. my_file.tar will store the image. Open it with tar -xvf my_file.tar, and you will get to see all the layers. If you dive deeper into each layer you can see what changes were added in each layer. (They should be pretty close to commands in the Dockerfile). and you can see that is very much like an OS. A Docker image packs up the application and environment required by the application to run, and a container is a running instance of the image. Images are the packing part of docker, analogous to "source code" or a "program". Containers are the execution part of docker, analogous to a "process". In the question, only the "program" part is referred to and that's the image. The "running" part of docker is the container. When a container is run and changes are made, it's as if the process makes a change in it's own source code and saves it as the new image. Image is a source code. When source code is compiled and build, it is called as application. Simillar to that "when instance is created for the image", it is called as "Container"
Image is an equivalent to a class definition in OOP and layers are different methods and properties of that class. Container is the actual instantiation of the image just like how an object is an instantiation or an instance of a class. Container is a division (virtual) in a kernel which shares a common OS and runs an image (Docker image). A container is a self-sustainable application that will have packages and all the necessary dependencies together to run the code. An image is to a class as a container to an object. A container is an instance of an image as an object is an instance of a class. Dockerfile is like your bash script that produce a tarball (Docker image). For a dummy programming analogy, you can think of Docker has a abstract ImageFactory which holds ImageFactories they come from store. Then once you want to create an app out of that ImageFactory, you will have a new container, and you can modify it as you want. DotNetImageFactory will be immutable, because it acts as a abstract factory class, where it only delivers instances you desire. Image – It is the building-block of a container. It is actually a kind of a snapshot of the virtual but is more lightweight. Container – It is a method of virtualizing the operating system so that an application and its related dependencies could be executed in resource-isolated processes. While we use a docker, we get a base image at the moment. We then boot it, make the relevant changes and save those changes in layers forming another image. A container is basically an instance of an image. This means that a running image is a container. If a person starts an image, he is actually running a container at the moment. One may have a number of running containers at a time of the same image. Not the answer you're looking for? Browse other questions tagged docker docker-container docker-image or ask your own question. In Docker, what's the difference between a container and an image? How to run a CMD and open Bash when running a docker container? what about the docker image if a container is crashed? What's the differences between layer and image in docker? Does a Node Docker container has to be started for Gulp us?